Rate this project Phil Miller has announced the release of Chakra GNU/Linux 2011/04, an Arch-based distribution featuring the latest KDE desktop: "The Chakra development team is proud to announce the release of Chakra GNU/Linux 2011.04, code-named 'Aida'. Two month have passed since Chakra 2011.02. Now it is time for Aida to impress. We added kernel 2.6.38.4 and lots of package updates. KDE got updated to 4.6.2 with our patches added, such as our hardware detection, including the latest drivers. Manuel Tortosa managed to remove all GTK+ dependencies from LibreOffice, so you can use it from our DVD edition on your KDE desktop without GTK+ installed. Also we added AppSet as our front-end for Pacman. For all our GTK+ fans we have added some popular GTK+ applications as bundles." Read the rest of the release announcement for more details. Download: chakra-2011.04-kde462-i686.iso (686MB, MD5), chakra-2011.04-kde462-x86_64.iso (697MB, MD5). 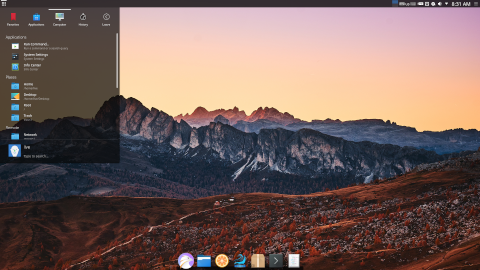 Luca Giambonini has announced the availability of the second release candidate for Chakra GNU/Linux 2019.01, an upcoming major new update of project's desktop distribution featuring the latest KDE Plasma: "Chakra 2019.01 'Hawking' RC2 released. The second release candidate is ready; except for the Calamares bug, the RC2 is very close to be the final version. What's new since RC1: added vdpau driver and libraries to enable hardware accelerated video; moved the Kickoff menu from the Latte dock to the top left corner; renamed 2019.01. Fixed: slow start-up in live mode; slow start of Calamares (around 1 minute the first run, caused by fc-cache); update images in Calamares and Heritage. Known issues: Calamares crashes during the partition selection (see bug report). The testing version does not contain the final release name, but it is tagged by the commit tag and date." Here is the brief release announcement which also links to the earlier RC1 announcement with some more information. Interested testers can download the new Chakra ISO image from here: chakra-2018.12.29-401367c6-x86_64.iso (2,018MB, SHA512, signature, pkglist). The Chakra GNU/Linux project has announced the release of a new snapshot of the semi-rolling release distribution. The new installation media carries the version number 2017.10 and offers several package upgrades as well as an updated system installer. "The 2017.10 ISO is a maintenance release. As always, it is a snapshot of our stable repositories and includes all the package upgrades and changes that have happened in Chakra since the previous ISO release. Noteworthy changes include: New versions of the Linux kernel, Xorg server, and graphics drivers. Support for mesa libglvnd1. Dropping support for catalyst. The installer, Calamares, has been updated to version 3.1.5. Our home grown Heritage theme for Plasma received several improvements in the logout screen and icons. This release also ships with the following package versions that already available in our repositories..." A list of updated packages, along with screen shots of Chakra running the Plasma desktop environment, can be found in the project's release announcement. Download (SHA256): chakra-2017.10-goedel-x86_64.iso (1,976MB, torrent, pkglist). The Chakra GNU/Linux project, a semi-rolling desktop distribution, has received an update. The developers have announced a new version, Chakra 2017.03, which carries the code name "Goedel". The new snapshot features the Calamares 3.0.1.91 system installer which includes support for installing the distribution on Btrfs and LUKS encrypted partitions. "We are excited to announce the first Chakra release of 2017, codenamed Goedel, to honour the logician, mathematician and philosopher Kurt Goedel. The 2017.03 release introduces two noteworthy changes: 1. The installer, Calamares, has been updated to version 3.0.1.91. As a result, users are now able to install Chakra on Btrfs and LUKS encrypted partitions. Calamares has received lots of partitioning enhancements and bug fixes since our previous ISO release and the installation process should be smoother than ever. 2. Our homegrown Heritage theme for Plasma got a refreshing face-lift that we hope you will enjoy." Further details and version information for key components can be found in the project's release announcement. Download (MD5): chakra-2017.03-goedel-x86_64.iso (1,966MB, pkglist). Neofytos Kolokotronis has announced the release of Chakra GNU/Linux 2016.02 (code name "ian"), the latest stable version of the KDE-centric distribution originally forked from Arch Linux: "We are happy to announce the release of Chakra's first 2016 ISO image, codenamed 'Ian', in memory of the late Ian Murdock, the founder of Debian. This ISO image doesn't introduce any major changes, but it offers an updated snapshot of our stable repositories to new users. It can be considered a maintenance release, providing all the bug fixes and package updates that occurred in the last three months, ever since the previous ISO image was released. As always, we ship the latest available versions of KDE's Plasma, Applications and Frameworks. The 2016.02 'Ian' ISO image ships with the following notable packages: KDE Plasma 5.5.4, KDE Frameworks 5.19.0 KDE Applications 15.12.2, Calligra 2.9.11, Linux kernel 4.2.6, X.Org Server 1.17.4, systemd 228, Qt 5.5.1, MESA 11.0.6, NVIDIA 358.16, Catalyst 15.9...." Read the release announcement for more details and a screenshot. Download (MD5) the live DVD image from SourceForge: chakra-2016.02-ian-x86_64.iso (2,144MB, torrent, pkglist). The Chakra project has announced the availability of new installation media for Chakra GNU/Linux. The new version, Chakra GNU/Linux 2015.11 (code name "Fermi"), uses KDE's Plasma 5 as the default desktop environment. The Calamares system installer has replaced Chakra's Tribe installer and the SDDM display manager has been included as it integrates well with KDE's Plasma. "We are delighted to announce that Chakra 2015.11 'Fermi' is out. As always, this release is a snapshot of our stable repositories and includes all the updates and changes that have happened in Chakra since the last release. The Fermi series of ISO image releases marks some very important changes for Chakra: Plasma 5 is the default desktop environment, replacing kde-workspace 4; Calamares a new modern installer which is actively developed, it has replaced Tribe; a new repository structure which includes changes aiming at simplifying things for both developers and users; a new display manager, SDDM, which is very well integrated with Plasma 5; new artwork, code-named 'Heritage', which is a fork of the very successful Caledonia artwork, together with new wallpapers." Further details can be found in the project's release announcement. Download (MD5): chakra-2015.11-fermi-x86_64.iso (2,055MB, torrent, pkglist). Neophytos Kolokotronis has announced the release of Chakra GNU/Linux 2015.03, a new update in the project's "Euler" series which follows the KDE 4.14 line: "The Chakra team is happy to announce the third release of the Chakra Euler series. This is a maintenance release to fix some installation issues and provide all the updated packages that landed in the stable repositories since the previous release. The main new feature is that our ISO now supports booting and installing on UEFI systems! We are aware that everybody is looking ahead into Plasma 5 and we are working on the transition, but we believe it is too early for this to be shipped by default and decided to wait for a little bit longer until Plasma 5 has matured and more KDE Applications have switched to Frameworks 5. This ISO ships with the following notable packages and updates: KDE Applications 14.12.2, except for the applications that have been ported to frameworks 5, which will remain on their 4.14.3 versions; kde-workspace 4.11.16 and kdelibs 4.14.5; Frameworks 5.7; Calligra 2.9.0...." The release announcement. Download (MD5): chakra-2015.03-euler-x86_64.iso (1,809MB, pkglist). Neophytos Kolokotronis has announced the release of Chakra GNU/Linux 2014.11, the project's latest update featuring KDE 4.14.2, the Pacman package manager and a custom installer called Tribe: "The Chakra team is happy to announce the second release of the Chakra 'Euler' series, which follows the KDE Applications and Platform 4.14 releases. The main reason for providing this new ISO image, in addition to providing a new KDE release, is that Chakra has now implemented the /usr merge changes. If you already have Chakra installed on your system manual intervention is needed, so please follow the instructions on how to properly update. For new installations using this ISO image, this is of course not needed. Core packages: Linux kernel 3.16.4, X.Org Server 1.15.2, systemd 216." Read the rest of the release announcement for further information and an important link to update instructions. Download (MD5): chakra-2014.11-euler-x86_64.iso (1,786MB, pkglist). Neophytos Kolokotronis has announced the release of Chakra GNU/Linux 2014.09, a desktop Linux distribution that uses the Pacman package manager and features the latest KDE 4.14 desktop: "The Chakra team is happy to announce the first release of the Chakra Euler series, which will follow the 4.14 KDE releases. A noticeable change in this release is the major face-lift of Kapudan, which now gives the option to users to enable the [extra] repository during first boot so they can easily install the most popular GTK+-based applications. As always, many updates to packages are available after installation. KDE Software Compilation: Chakra provides the latest stable version released by KDE, 4.14.1; dhcpcd has been replaced by dhclient as a dependency for NetworkManager. Core packages: Linux kernel 3.15.15, X.Org Server 1.15.2, systemd 216." Continue to the release announcement for more details and a screenshot. Download (MD5): chakra-2014.09-euler-x86_64.iso (1,728MB, pkglist). Neophytos Kolokotronis has announced the release of Chakra GNU/Linux 2014.05, the new stable version of the project's desktop Linux distribution featuring the KDE 4.13 desktop: "The Chakra team is proud to announce the first release of Chakra 'Descartes' series which will follow the 4.13 KDE releases. This new release includes new features and updates as follows: KDE Software Compilation - the latest stable version of the KDE series; Nepomuk search has been replaced by Baloo, we have implemented a patch that permits the user to disable Baloo; Chakra Tools are fully translated into more than 30 languages thanks to the amazing job done by our users on Transifex; artwork - new Chakra Logo and new default theme for GRUB, KDM, KSplash, Yakuake; NVIDIA 331.38 and Catalyst 13.12 drivers; Linux kernel 3.12.15, X.Org Server 1.14.5...." Here is the full release announcement with a screenshot. Download: Chakra-2014.05-Descartes-x86_64.iso (1,793MB, SHA512).